Anti-chain store campaigners in a Suffolk seaside town say Waterstones' opening of a bookshop will drive out smaller retailers. 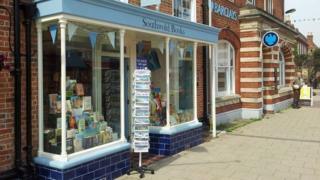 The shop trades as Southwold Books, but the Southwold & Reydon Society said it would contribute to the loss of the the town's independent character. The society said the growth of chain stores had led to rent rises and independent shops closing. The store said local people wanted it after the closure of other bookshops. The High Street shop, in the former Tourist Information Office, is the first Waterstones branch not to use company branding. It has followed the opening of other chain stores including Tesco, Jack Wills, Fat Face and Costa. John Perkins, secretary of the preservation society, said: "It's dishonest, because it's a national chain pretending not to be a national chain, but trying to look like a local shop. "When chain stores arrive you get a feeding frenzy of landlords putting up rents which drives out local independent retailers - the pet food shop is shut, Eco electrical store is closing next month and and the tourist office has had to move down an alleyway. "It's not a good thing as it changes the whole character of the High Street." Although other shops do sell books, the new store is the only dedicated bookshop, following the closure of independent bookshops in recent years. Matt Gretton, regional retail manager for Waterstones, said: "When we were at a literary festival here last year, it was local people telling us they wanted a dedicated bookshop again. "The name was because we wanted to fit in with Southwold as a town and because it's not on the same scale as a normal large town centre Waterstones. "There was opposition to Costa because there were already lots of other coffee shops, but this is the only dedicated bookshop."